I've been reading Bertand Russell's autobiography these past few weeks. 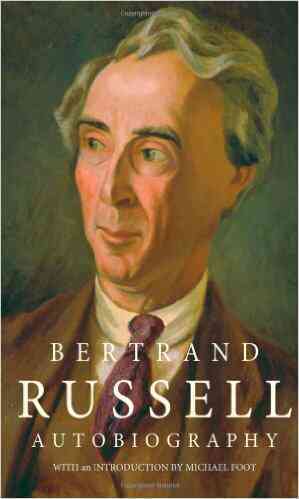 I've yet to read most of Russell's work, but I'm familiar with what he stood for and produced during his lifetime. I remember that what first hit me as terribly interesting, so much so that I had to read the book in only a couple of sittings, was having read his essay "Why I am not a Christian". The essay's tone is witty in all the right parts - which was something that made it easy to digest. Instead of the work being sermon-like, or worse, an insulting exposé by an Atheist, it was a calmly well-argumented take by someone who simply, for reasons very aptly laid out, did not agree with Christianity. This written work made me feel like I'd been part of a profound conversation with an open mind. One that made it O.K. for me, at that time a teenager, to agree (at least partly) with someone else's relaxed and contrary opinion on a very serious issue. Since that first encounter with Russell, I've perused with relative frequency, his page on the Stanford Encyclopedia of Philosophy. There's a great big summary of his work and doings throughout his life, much that I've become interested in. I've highlighted some interesting passages and key sentences I consider relevant from Russell's autobiography. "Three passions, simple but overwhelmingly strong, have governed my life: the longing for live, the search for knowledge, and unbearable pity for the suffering of mankind." "I think periods of browsing during which no occupation is imposed from without are important in youth because they give time for the formation of these apparently fugitive but really vital impressions." "...As I have grown older, I have realised more and more the importance she had in moulding my outlook on life. Hear fearlessness, her public spirit, her contempt for convention, and indifference to the opinion of the majority have always seemed good to me and have impressed themselves upon me as worthy of imitation. She gave me a Bible with her favourite texts written on the fly-leaf. Among these was 'Thou shalt not follow a multitude to do evil'. Her emphasis upon this text led me in later life to be not afraid of belonging to small minorities." "I have a very painful recollection: he came to Pembroke Lodge one June evening at the end of day of continual sunshine, every moment of which I had enjoyed. When it became time for me to say good-night, he gravely informed me that the human capacity for enjoyment decreases with the years and that I should never again enjoy a summer's day as much as the one that was now ending. I burst into floods of tears and continued to weep long after I was in bed. Subsequent experience has shown me that his remark was as untrue as it was cruel." "Nature and books and (later) mathematics saved me from complete despondency." "...the art of concealing her emotions..."
"...as she had a caustic tongue..."
"As I have grown older, however, my feelings have changed. I owe to the Russells shyness, sensitiveness, and metaphysics; to the Stanleys vigour, good health, and good spirits. On the whole. the latter seems a better inheritance than the former." "As soon as I realised I was intelligent, I determined to achieve something of intellectual importance if it should be at all possible, and throughout my youth I let nothing whatever stand in the way of this ambition." From "Chapter 2 - Adolescence"
"It became second nature to me to think that whatever I was doing had better be kept to myself, and I have never quite overcome the impulse to concealment which was thus generated. I still have an impulse to hide what I am reading when anybody comes into the room, and to hold my tongue generally as to where I have been, and what I have done. It is only by a certain effort of will that I can overcome this impulse, which was generated by the years during which I had to find my way among a set of foolish prohibitions." "I was told that all introspection is morbid, so that I regarded this interest in my own thoughts and feelings as another proof of mental aberration. After two or three years of introspection, however, I suddenly realised that, as it is the only method of obtaining a great deal of important knowledge, it ought not to be condemned as morbid. This relieved my feelings on this point." "For I took the view then, which I have taken ever since, that a theological proposition should not be accepted unless there is the same kind of evidence for it that would be required for a proposition in science." "It appeared to me obvious that the happiness of mankind should be the aim of all action, and I discovered to my surprise that there were those who thought otherwise." Don't worry, I'm an economist! Making causal inferences in economics: Do better grades lead to higher salaries?